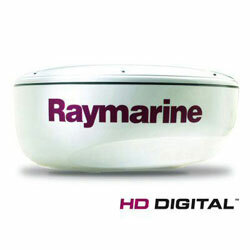 Raymarine’s HD Digital radome scanner combines the power and clarity of HD Digital signal processing with an ultra-compact scanner suitable for all types of vessels. Compatible with C-Series Widescreen, E-Series Classic, E-Series Widescreen,G-Series Multifunction Displays and the New e-Series and c-Series. These radomes offer a 256-color radar display and the clearest, most lifelike radome presentation available from any radome scanner. The RD418HD feature the same adaptive digital receiver technology found in open array antennas. By adjusting automatically to changing environmental and sea conditions, the HD Digital radome provides crisp, accurate contact echoes at short ranges, as well as outstanding long range performance up to 48 nautical miles. Adaptive digital receiver automatically adjusts to changing environmental and see conditions for a dramatically clearer picture. 256 color multi-level target display with selectable color palettes. New Bird Mode automatically optimizes the receiver for detecting sea birds above schools of fish. New High Speed Mode (48 RPM) automatically engages for optimal tracking of high speed targets at short ranges. Dual-range mode allows you to monitor both long and short ranges simultaneously with a single scanner and display.